If you're wondering whether or not to do some extracurricular work outside of your timetabled course, the answer should always be yes. The more you further your experience and skills the brighter your future will look. 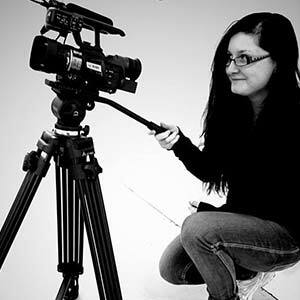 As a third year student, studying Television and Broadcasting, I'm lucky enough to have hands on experience with filming equipment, on location shoots and different types of editing software, such as Avid and Adobe Premiere Pro. It was because of this I put myself out in the 'professional world' to see what the difference in experience from student to professional would really be. I believe gaining any experience outside of my timetable is very beneficial to my future, it helps me gain knowledge and experience of the real world while having a safety net of my course behind me. Through first and second year of my course I have taken part in extra filming sessions, helped out on induction days, to practice with different types of filming equipment, I was a runner at the Victorian Christmas Festival in Portsmouth Dockyard, and learnt a lot about physically building and dressing sets for performances. The size and length of time this extracurricular work doesn't matter, so long as I can keep learning and furthering myself for a future in the television industry. I decided that after my second year at university I would try a year placement, which unfortunately didn't work out as planned. So I then started applying for as many short internship and running jobs as possible for over the summer. Fortunately most film and television companies are based in and around London, which came in handy as I only live a short distance outside of London itself. This meant I could apply to all the big and small opportunities in London as well. Finding and applying to professional jobs in my chosen industry was a very daunting task. However, the fearful part of me made sure I was ready for anything that got thrown at me in the interviews and put me in the mindset to succeed, even if it meant detailed research of each company. After applying to countless opportunities and being turned down a few times, with some just not responding, I started to lose heart. It was then that I got a surprising email advertising a short three month paid internship within the Institute of Fundraising, with the Remember A Charity team in London. I didn't see any harm in applying to it, even if it was a little out of my league in terms of skills. At first I thought my internship was going to be extremely hard and wondered if I could live up to 'professional standards' of the real work place. I expected a huge amount of pressure and stress to hit particular deadlines, and to create high enough quality content for them to recognise me as something other than a student; it's one thing to try and meet professional standards, it's a whole other thing when it's simply expected and required. I was worried at that the experience could change what career path I want to peruse, where I want to work, and if everything I learnt could only be applied when filming a live TV show. In addition to this, I wanted professional experience where I didn't have a safety net ready and waiting to correct any mistakes. It was terrifying at first, but ended up being such a reassuring experience that really boosted my confidence in my skill set. The interview section was particularly scary as I had to do a few minutes on the phone, then have a meeting in person with a member of the Remember A Charity team. As luck would have it, the person I spoke to and met was extremely friendly and made the nerve racking experience seem easy. I find we tend to build up our expectations others have for us, make ourselves nervous and anxious only to realise we had nothing to be worried about to start with. It was all worth it though as I actually got the job I wanted! It was a big realisation when I found my internship with the Remember A Charity team was extremely similar to what I have been doing on my course the last two years. I had to help film and edit four short interview pieces and a teaser trailer for the Remember A Charity team, skills I learnt within my course. The Remember A Charity team were very welcoming and were always there to aid me where needed. With a given direction I was allowed to learn new software, and practice on new equipment that I hadn't had any experience with in the past. Yet, after learning to use Avid editing software in my course at university, I felt confident applying that knowledge to using Premier Pro editing software; Surprising me how transferable the software skills truly are. After getting used to using mixpre's for sound, JVC 600 cameras for filming, RedHead lights to get a professional look, I was shocked at how little you really need to film an interview in a professional environment. I was cautious at first to use such little equipment on locations I had never been before, that varied from a football stadium to a law office, and how to use a photography camera with a Magic Lantern add-on to film. I found that once I had some practice with the equipment, my university skills helped the shoots run smoothly. Also I felt prepared for the edit as it was very similar to how I imagined it to be, with me editing to a brief and making small changes here and there for my employer. The experience I gained over the summer really allowed me to gain perspective on what is expected of me in my future career. Also, by doing it while at university I got the chance to realise my weaknesses and really work to improve them before going out on my own into the 'real' world.